I just had to share my exciting news. 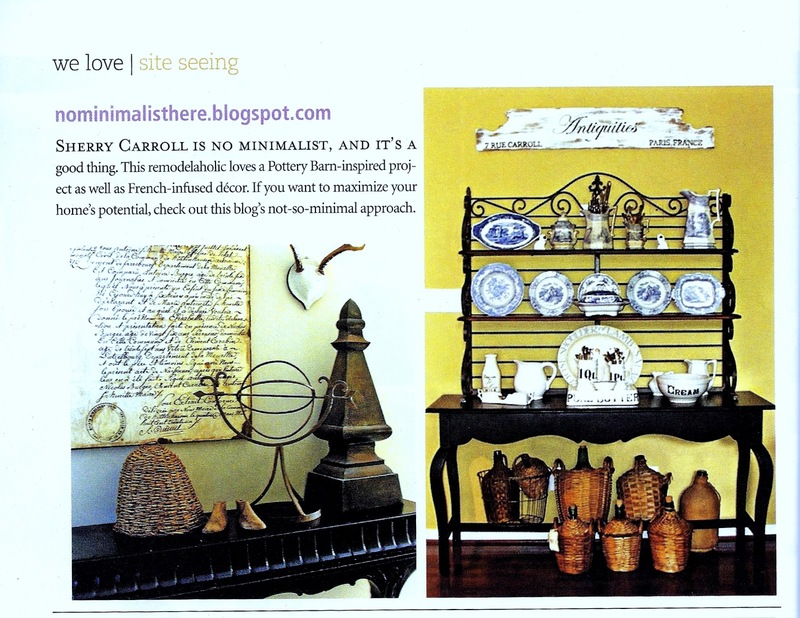 in the April issue along with some of my favorite blogs. what does a skeptic do but google the editors name and sure enough she was legit. and Paula was kind enough to post a picture of it on Facebook for me. I am still kinda doing the happy dance! Congrats Sherry! You do have a great blog! I saw that! I was SO excited for you! Yay!Hold your horses…I think you're going to get busy! CONGRATS Sherry!! I can't wait to pick up a copy! Congratulations – how exciting for you – you certainly deserve it. You have a beautiful home and blog. That's amazing and so exciting. I am so happy for you! Congratulations!!! Congratulations, Sherry! You deserve it! Congratulations on your beautiful home being featured, Sherry! Congrats Sherry, I saw your feature, and was giddy. Sherry – thats awesome. There is something extremely exciting about seeing your home in print for some reason. I remember the excitement well. Congrats on the recognition!!!!! Well deserved. So happy for you Sherry! Well deserved indeed! So happy for you! Thanks for sharing this exciting news. CONGRATULATIONS!!!!!! That is so awesome:) You must be so thrilled:) I will check it out. Congratulations!I will look for that magazine when I am out at the book store. HI Sherry~~I saw you in there!! Congrats girl! I am in there too! So fun, but not fun waiting on it in the mail…still have not received it. So yesterday I headed to Barnes and Noble and bought two copies. You might try that store if you have one near you. How exciting!! I love to read Romantic Homes and to see a blog I know will be thrilling! Wow! I'm so happy for you Sherry! This is soooo AWESOME!!! Congrats to YOU!!! It is always fun to see your name in print. Congrads. You deserve it. Richard from My Old Historic House. CONGRATS TO YOU! No one more deserving! LOVE YOUR BLOG! Wow! I have that very issue in front of me right now, looking at Pat's photos from http://www.backporchmusings.typepad.com. Now I have a double whammy with yours featured also! Congrats!!! Congrats, Sherry! I do like your blog. And I am no minimalist either…. LOL. Congratulations! How exciting for you…and for the lucky readers that will discover the great home tours you take your readers on each week. Yay! Congratulations on your well deserved accolades in RH magazine! Congratulations Sherry, Your Blog is fabulous, I am not surprised they chose you. You inspire me everytime I visit. I will be on te look out for it. How eciting Sherry! You just never know who is reading your blog…congratulations to you and enjoy that cloud you're on!!! How exciting! What a beautiful magazine to be featured in! Congratulations! YAY!! DID I NOT JUST TELL YOU HOW GREAT YOU WERE AT THIS!! CONGRATULATIONS, YOU REALLY DESERVE THE RECOGNITION, SO CONTINUE WITH THE HAPPY DANCE!! Sherry, that is quite a feather in your blog cap, you must be elated. Your blog always provides such beautiful pictures and wonderful ideas. Glad to hear you've been national recognized. Congrats! Sherry that is so exciting. I couldn't be happier for you. Congrats! Can't wait to get my issue and say "I KNOW her!". LOL! Congratulations! That's very exciting and I can't wait to get my copy! 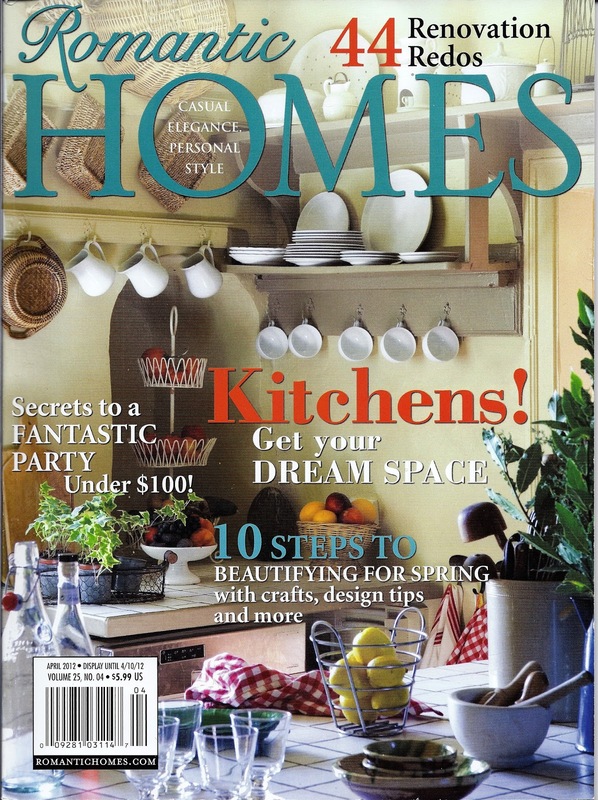 What an honour to be featured in Romantic Homes magazine, Sherry, and it's so well deserved! Congratulations! How fabulous! Many Congratulations Sherry, you deserve it as your blog is fab! Congratulations!..What a great and well deserved honor! I will make certain to pick up a copy! Sherry, that is just wonderful news! Well deserved recognition. I bought it … I saw it … and I said "I know her!" So excited for you. that is just wonderful! Congrats Sherry, wow!! You deserve this honor for sure sweet friend! Hope I can get the magazine soon. Have a happy weekend. What a totally fun experience! Congratulations…on being featured in one of my favorite magazines. Can wait to see my copy. I am so happy for you! I can't wait to pick up the April issue. Congrats to you! CONGRATULATIONS! You bring honor to us all. You have a wonderful blog and the excitement must be amazing. We all share you joy with you! Congratulations, Sherry! You so deserve it!! What an awesome honor! Of course you were! I hope to see more of you in Magazineland! Congratulations, Sherry! It is a well deserved honor! How exciting for you. Congratulations! I am a subscriber to the magazine and can't wait for mine to arrive. I have subscribed to Romantic Homes since 2001 and have all my issues. I love them all! Congratulations! That is so exciting. I happened to see that issue yesterday at Walmart. I have been looking for it ever since I heard about some bloggers being featured. Your blog is famous now! Haha you are so funny Sherry, googling the Editor's name! I don't have this issue yet but will look for it. Congratulations! Congratulations! How exciting. I'm so happy for you. Congrats. Your blog is wonderful. You so deserve to be featured. I know her! (In my very best Buddy the Elf voice). Sherry that is wonderful and exciting news. Truly! Congratulations. Hugs and wishes for a beautiful day. P.S. I hope you will stop by and say hello and enter the latest giveaway too. How cool is that??!!!!! I'm thrilled for you. All of us who visit often know you deserve this delightful honor! Tres cool Sherry!! So exciting, congratulations! But, I don't know why you're so surprised- your blog and home are beautiful!!! So, so very exciting and well deserved, indeed !! Congrats !! Congrats, Sherry! You do have a beautiful blog! I can't wait to see the magazine in person! Sherry Congrats! How exciting good for you. HI Sherry, a huge Congrats on your feature! I am a sceptic like you, but I'm glad you went ahead and sent the pictures. SO exciting to have the recognition you deserve!! Congratulations!!! I saw that picture, but did not look at the blog name!! I know a star! Congratulations! I'm so happy for you, Sherry. I need to pick up a copy.